Hey Blog readers. Sorry the blog's been a bit in active in the past week or two. After the delay due to hurricane Sandy, I was just recovering when I sustained an injury playing volleyball (I'm a captain of a team in Gotham Volleyball here in New York City)... I apparently tore an Achilles tendon and it is apparently bad enough to warrant an operation. 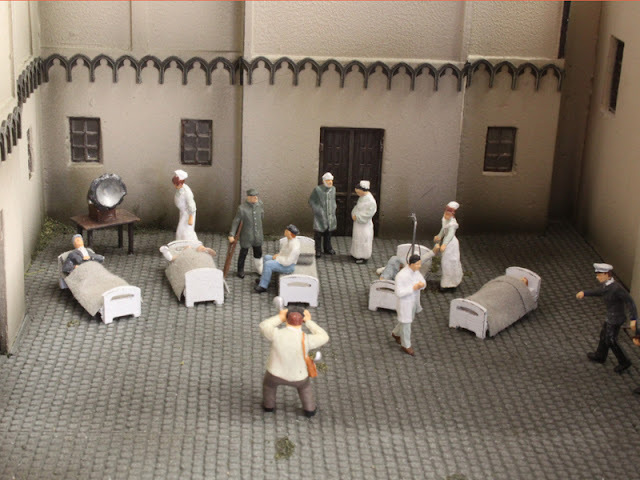 I am hoping the facility will be more modern than the one shown above which is a World War I military hospital diorama that can be found at Miniatur Wunderland, the very elaborate miniature railroad layout in Germany (the largest in the world). See our previous posting too, from February 2011. After my recovery which I think a week or two, I will be back posting. See you all then! ouch. Hope you are feeling better!